If you’ve seen my promotion for Rocket Retainers & Power Pacts: Engage Clients Faster, Get Paid Quickly and Innovate Without Risk, you’re probably wondering how a retainer agreement can earn you money. 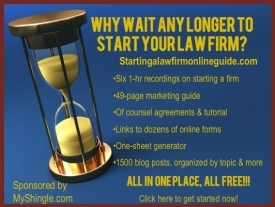 Conveniently, this recent news story — about an Illinois attorney who’s out a $469,000 referral fee because the retainer agreement with the client failed to disclose the fee split between the referring and principal attorneys– provides a timely example of how much an improperly drafted retainer agreement can cost your firm. Here’s what happened. Back in 2006, Crystal Lake, Illinois attorney Richard Naughton referred a medical malpractice case to a Chicago colleague, Bruce Pfaff with the understanding that Naughton would receive a one-third of the legal fees recovered by Pfaff. Naughton had previously referred cases to Pfaff without incident under a similar generalized arrangement. In 2008, Pfaff settled the case for $7.9 million, but refused to pay Naughton a referral fee which amounted to $469,000. Naughton sued Pfaff for the fee, but lost. The reason? Pfaff’s representation agreement with the client did not disclose the fee share arrangement between the two lawyers as required by Illinois’ rules of professional responsibility. Because the referral fee was neither disclosed to nor approved by the client, the court ruled that Pfaff was not obligated to pay. And while the court had harsh words for Pfaff’s conduct– admonishing that the practice of law “is not a battlefield where knights in not-so-shining armor, when they are fortunate to recover funds on a client’s behalf, should refuse to share their prize with justly deserving colleagues as if they were all knaves” — that’s not the same as a six-figure fee. Naughton could have avoided this outcome either with a limited retainer agreement with the client, informing her of the referral to Pfaff and disclosing the fee arrangement. Alternatively, Naughton could have negotiated with Pfaff a “power pact” in the form of a referral fee agreement which would obligate the principal attorney to disclose the fee split to the client, and provide the referring attorney the right to review the agreement as a condition of the referral. [Note: in other jurisdictions, attorneys may need to meet additional requirements to qualify for collection of a referral fee]. That’s just one example; there are dozens of other ways that lawyers can use retainer agreements and power pacts to get paid or expand the scope of their practice. Join us for the FREE webinar on August 18, 2016 by registering here , or take advantage of our special pre-sales price of $59.95 through August 12, 2016 (the product will be available by August 19). Contact me at carolyn.elefant@gmail.com with any additional questions.